Two weekends ago one of my friends from college came west for a bit of climbing and a long weekend. 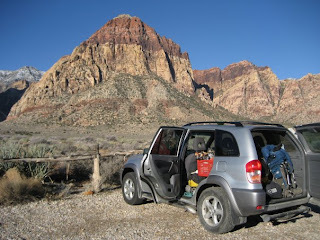 Lizzy and I met Rebecca at the Las Vegas airport Wednesday night and took her to the 13 mile campground. We had driven out earlier that day from LA and had set up the tents and went food shopping. Luckily her flight from Detroit, which connected through the notorious Denver, was on time and we were asleep by midnight. It had rained a bunch on Wednesday but the night proved clear which we hope would give the rock some time to dry. A bit of a slow morning lead us to the loop road and on our way to Pine Creek Canyon. 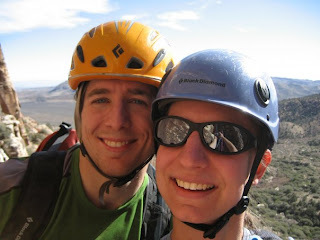 We choose Birdland for our first climb since it had decent sun exposure and was about the grade we were looking for. Lizzy got harassed by the climbing ranger warning of wet rock and danger conditions when she tried to apply for a late exit pass. Despite the warning we went forward to our sunny route which worked out really well. Our aim for the day was to do Birdland 5.7+ six pitches and then rap the route and do Cat in the Hat 5.6 six pitches. We were looking for moderate climbs so that Rebecca could work on her trad placements and get to lead while multi-pitching. The hike to Birdland was nice and short and the wall seemed pretty dry despite mud on the approach. Lizzy lead the first pitch and our multi-pitch adventure began! Rebecca seconded and cleaned all the gear to give her a better feel for placements. I followed at roughly the same time since we were using double ropes. Lizzy linked the next two pitches, which featured a cruxy traverse that she led brilliantly, despite heinous rope drag from one of the ropes being stuck in a crack. Next was Rebecca’s lead which traversed across the headwall (photo below) to a belay below the final and crux pitch. 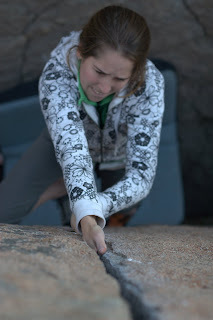 Rebecca was a natural at placing nuts and managed to find a few cam spots in the discontinuous cracks on her pitch. I linked the next pitch into the loose final pitch to lead us to the top of the climb. To save time and avoid the loose rock above we rapped the route instead of summiting the formation. Rapping provided more excitement than anticipated when we got a rope stuck on the second rappel. I had to re-lead and then down climb part of on of the pitch to retrieve the rope. 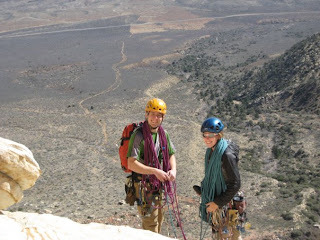 Fortunately we were able to make it in only three rappels with 10 feet of down-climbing at the base. After lunch, and packing up all the gear, we hiked over to the base of Cat in the Hat to start our second route. Due to relaxed start and our trouble rapping it was a bit later than we had hoped. 3:30 pm mean that we did not have much time to climb but we decided to go up anyways. An earlier party was just finishing rapping the route and a local was rope soling the start to try to remove a cam. This added a bit more delay and confusion to the situation but worked out in the end. 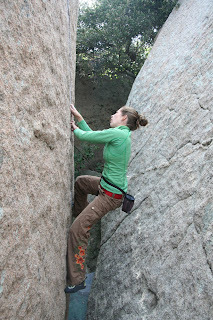 Rebecca opted to lead as much as she could and started climbing up the tricky first pitch. It had lots of fun water holds but was a bit polished from all the traffic. She linked the first 2 pitches in no time which brought us up to a big terrace. We moved the belay and she climbed up to the 5.5 boulder problem. There was a bit of excitement despair and confusion when Rebecca initially thought it was a V5 problem. Yikes… wouldn’t that be a surprise when you are already 100 feet off the ground! 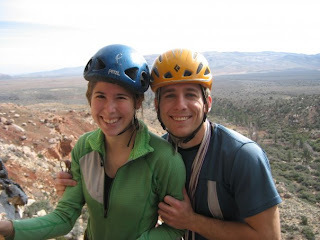 After sending with little hesitation she raced up the rest of the 3rd pitch to a tree belay. Despite climbing quickly thus far it was starting to get a bit darker and the temps were dropping. The next pitch, Rebecca’s hardest yet, would chill us completely as the sun went down while Rebecca was searching for the belay boulder. 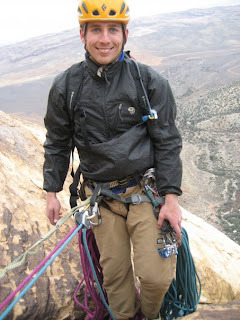 In order to save time I climbed the pitch with numb fingers leaving Lizzy my vest to stay warm at the belay. We quickly rapped and luckily had no stuck ropes in the dark. The heat from repelling was quite welcome by my hands and when we reached the base I was warm again. A nice hike from the Mescalito led us to the car and then the campground. Sadly rain started falling right before we reached the car and it rained the rest of the night. We got a late and soggy start on Friday bummed by the rain which had canceled our hopes of doing solar slab. After chilling in the gear shop we headed to the movies to kill some time in the hope that the rain would stop and the rock would dry by late afternoon. We saw Jumper which was hollow yet quite entertaining and almost opted for a double feature before getting the cold stare from the movie attendant. We decided to check on the Red Rocks weather since it was bright and sunny at the movie theater. A short drive and we were back cruzing around the loop road. We went to Willow Springs to check out Ragged Edges and show Rebecca some cam placments. We opted for this area due to the short approach but were punished for choosing an upcanyon location. After intermittent rain a serious cloud came in that dropped a ton of hail. We crunched under a small roof (photo above) to wait until the cloud passed. We then ran back to the car, soaked in our jackets, from all the stormy weather. After our inability to find dry rock or sun in Red Rocks we turned our hope to the local limestone crags. We had been told to go to either the gun show or urban crag by gear shop dude and thought we might as well try. When we showed up at Urban Crag we saw a max exodus of people and so we just kept driving to the Gun Show. The Gun Show was clearly wet so with no more hope we drove back to the Urban Crag and hiked up to the rock. 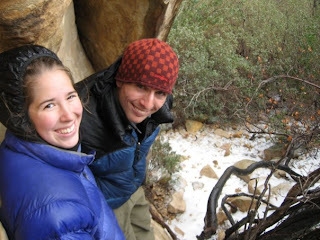 The rock was dry and Lizzy found a quickdraw so we deceived to go back to the car and get our gear. 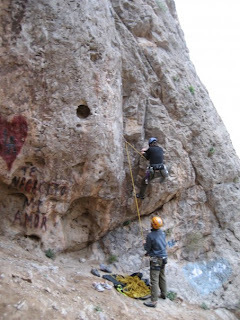 We did this one pokey route (photo above) that was fun and funky and then I top roped a much harder one the left. Rebecca tried it as the sun went down and we bailed soon after. We needed to get some sleep in the hope that the next day was sunny. The next day was beautiful so we got up and got out to try and climb Solar Slab. We were a bit late starting and didn’t leave the parking lot at the Oak Creek Canyon pullout until nearly 8am. We got to the wall and had the place to our selves. Lizzy cruised up Johnny Vegas and we started seeing people show up at the base. We lounged in the sun giving the upper pitches more time to dry and Rebecca racked up for the first pitch of solar slab. In the photo above solar slab is the long white slab on the left side of the large formation. I was to lead next and get the two weird pitches out of the way. There was a bunch of hail on one ledge and a nice water streak down the face and in the crack I was supposed to climb. They guys from SLC did not link the pitches so we had some extra time to relax and eat some lunch. We were going a bit slower than we wanted but I did not want to crowd the next belay. After food I linked my pitches and set up a belay on some shrubs to the left of the bolts. The water streak had soaked the bolts and was coming out of the crack for the next pitch. Once Lizzy and Rebecca reached the belay I started climbing again linking the next two pitches and ending at a nice ledge with a puddle on it. To avoid the wet crack at the start I climbed patina off to the side which was not to hard and quite fun. These two pitches were very nice and I really enjoyed a full 60m of climbing. We were getting pretty close to the top and Rebecca wanted to get in some more pitches. She led next up a long crack that was not to her liking. Unfamiliar with jamming techniques Rebecca carefully took her time making her way up the pitch. At one point she was supposed to traverse right to a bolted anchor but I gave her the wrong instructions and urged her to keep going. She had to build an anchor next to a bolt in order to belay us up. 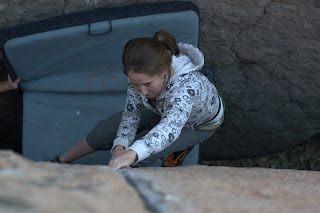 I had gotten confused by the way the previous party had gone and insisted she keep climbing past the correct traverse. Lizzy and I were quite cold at this point since we had been in the shade for a long time so I took back the lead. 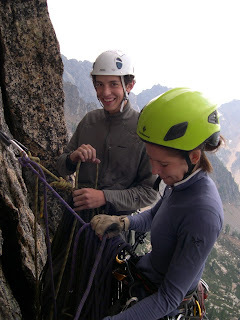 2 more pitches, which I linked, lead to the last rappel station which was our summit. I was able to get the girls on belay quickly and they raced to the summit, eager to get warm. We didn’t idle at all since we didn’t want to have to rap in the dark and I started my way down. Eight rappels led us all the way to the ground with a bit of walking to get to the Johnny Vegas rappels. We were super lucky and didn’t get the rope stuck and only had to our last rap in the dark! The hike back to camp was easy and Rebecca was super stoked for such a long day of climbing. It rained on and off Sunday morning and we did a bit of limestone climbing at the Gun Show. After a relaxing lunch at Pantera and some shopping we dropped Rebecca off at the Vegas airport and made our way home. 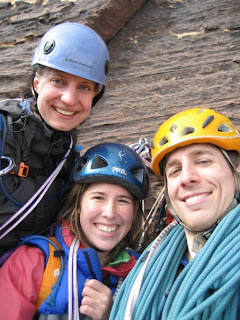 It was a great bunch of climbing despite all the bad weather and I am sure Rebecca is psyched for some more trad climbing! Multipitching is a great thing to do – climb lots of pitches in a row, get way high off the deck, push your mental and physical limits. Awesome, right? But one thing I know that is not awesome about multipitching is rope spaghetti – that mess of ropes and slip knots and having to step in, around, through little loops of rope just to be able to start leading again, only to get shortroped because the rope is hopelessly tangled down at the belay. But do not despair, you can fight this evil! I’ve compiled some basic tips garnered from Luke’s and my experiences on long routes trying to fight the tangle. (1) It’s almost always worth the extra time to organize your ropes. The time saved not having to undo a knotted rope is important. (2) When you have 2 followers (especially if you’re belaying both on a reverso), separate the ropes as you bring them up. Whoever has to lead next with both ropes will thank you for not getting short-roped the entire pitch. (3) Take care to keep your leash (clove-hitched end of the rope and/or your daisy chain – basically your attachment point to the anchor) away from the ropes you pull up and the leashes of your follower(s). You don’t need to put to much brainpower into belaying, so as you do, think about where to direct your follower(s) when he/she/they arrive. Usually you want your leash(es) to be on top of everything and the followers to be underneath everything. This is the easiest situation – you have a nice, big ledge with plenty of room to flake your rope(s) onto the ledge. If you have 2 ropes, put them in separate piles. If you are leading the next pitch, remember to “pancake flip” the rope pile(s) – just pick up the whole thing and flip it upside down. This starts to get complicated. Sometimes you reach the anchor and you have a ledge, but a small one. Sure, you could just flake the rope onto the ledge on top of your feet, but what if you have 2 ropes? And then where are the follower(s) going to stand? This is where the stacked lap coils come in. Luke and I use this all the time and it works really well. It deserves it’s own section, so keep reading to find out more! As the area you have to stand on gets smaller, you have to be even more careful about where to direct your follower(s) so as not to get the rope(s) twisted. The hanging belay can be pretty uncomfortable, but it does have the advantage of actually making lap coils a little easier because you can make longer coils (since for most hanging belays the coils will just dangle below you). Unfortunately I don’t have a picture of this technique (I guess the belay stance isn’t exactly the most exciting image of the climb…) so I’ll try to describe it the best I can. The basic idea is to use your leashes to make lap coils of the ropes as you belay them up (this is mostly for having 2 followers or just using double ropes). I usually connect my daisy chain at it’s greatest length and then adjust the length of my clove-hitched rope to the anchor such that it’s either about 1 foot longer or shorter than my daisy chain. Then I pull the ropes up one by one and coil each onto either my rope leash or my daisy chain. I continue to coil the ropes like this as I belay the followers up. That way you get each rope in a separate (hopefully neat!) coil so they will be relatively unknotted for whoever leads next. In order for this to work, you probably need to be using a Reverso or equivalent auto-locking device that allows you to have your hands available to keep your 2 coils neat as you go. There is a little strategy you can use in your coils to make you life even easier. For example, if one of your followers is leading the next pitch, you should start your coil with longer loops and gradually shorten the length of the loops as you go, such that when you belay from the coil, the loops won’t catch each other and make slip-knots. If you’re leading the next pitch, you should try to make the coils about the same length (because you’ll have to pull loops from the bottom of the coil and it gets messy if you try to go small –> large loops). Red Rocks can really show you exactly how much a rock can want to grab your rope and not let go. 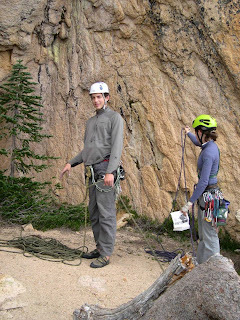 Although you mostly just have to be good at pulling the rope and positioning it while rappelling with good technique and a lot of luck to not get it stuck on the pull, there is something you can do to keep from having to swing all over the place to fix stuck rocks just to get to the next rap station. You can coil one (or both, if you have them) ropes and wrap a sling around each one (clipping the ends of the sling into the same carabiner. You don’t want it to to be wrapped too tight or else it won’t feed well while rappelling. Clip your rap device on the rope and you’re ready to go. No more stuck ropes (or, at least, one less). Despite the continued rain-on-the-weekend trend in SoCal this past weekend, Luke and I managed to catch some dry weather on Mt. Woodson on Saturday! I was feeling a little under the weather from the day before and the ridiculous week I had (ultimate frisbee has been the bane of my existence recently), so I chilled on the crashpads wearing all the jackets for the first couple minutes while Luke warmed up on Baby Robbins and Jaws. Then I felt better and warmed up by climbing Baby Robbins twice, and it was time to throw myself at Jaws. On my first serious attempt, I made it to the top, although I started about 4 feet up on top of the stacked crashpads. I was shaking when I made it to the top, but it did feel really good. Something just clicked and the jams felt way better than they ever had before. I took a break before trying again and on the very next try I sent it from the ground up. So there goes the first major step towards becoming a more awesome trad climber (and eventually climbing equinox!!!) Luke mentioned that he was excited to go spend some time working on equinox, so hopefully we can do that our next free weekend! Luke also climbed Jaws without the crashpads a couple times, which was pretty awesome, too! What is it about climbing that is just so inviting? What part of this crazy lifestyle drives us to keep on training? Why do we want to be outside pulling on rocks? One of the things that I really love about climbing is the community. People all over the world take part in rock climbing. 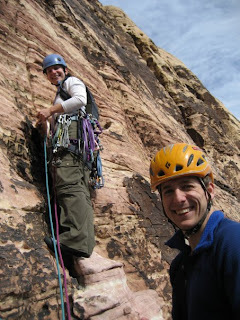 While there are many different crag, types of rock and styles of climbing we all share a certain drive. 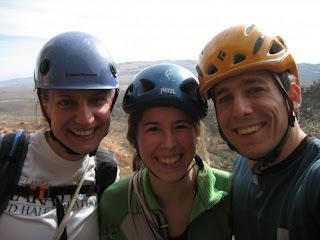 Within the climbing community I especially enjoy the common topic of climbing routes and problems. It is very fun to share tales of a route with other people who have also done the same climb Climbing offers such crazy and different experiences but we can some how manage to relate to each other. People are many different heights and have a variety of climbing strengths yet overcome the same climbing challenges. 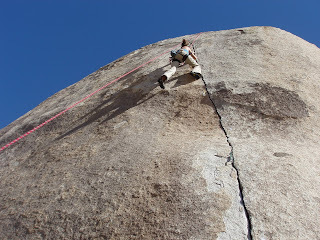 A given problem may be sent with many different sequences inspirited by the past experience of the climber but each climber must eventually reach the summit. Traveling different places and climbing the classic routes motivates me to climb harder and learn better technique. I don’t want to be specialist, on one rock type or in a single area, I want to be able to relate to lots of different types of climbers and climb a variety of routes. I want to see climbing areas and think of the problems that I have done there. A great part of climbing for me is reliving the memories of climbs and thinking of all the beautiful places climbing has brought me. A recent post by Jamie Emerson about Horse Pens 40 inspired this nostalgia. I really enjoy climbing at HP40 and it got me thinking about all of the great problems there. I made various trips to HP40 while I was in college. It was worth the 10 hour drive and I sent my first V5, V6 and V7 on the wonderful southern sandstone. It was the first real outdoor bouldering destination that I had ever been to. Until college I had been a route climber, far to week to do any real outdoor bouldering. 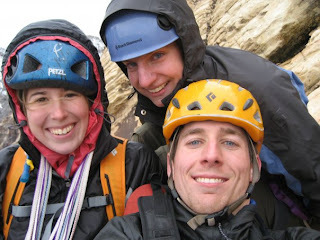 College also led me to the Red River Gorge where I quickly fell in love with overhanging sport climbing. The strength gained from bouldering at our gym in college led to my first 11’s and 12’s at the Red. My junior year I took a semester and traveled to Australia to study Computer Science and work on my trad climbing. There I redpointed my first 22 trad route (11b) and struggled with ethics when pinkpointing two other 11b routes. My desire to push my physical limits hit up against the idea of getting hurt by being too bold. My fear was that a fall on improperly placed gear would result in a ground fall. My only solution to leading these hard, yet beautiful, routes was to pre-protect them so that they could be lead more safely. My trip down under also included some sport climbing with my first flash of a 23/24 (11c) and on a trip to New Zealand my first 24 redpoint (11d). These routes stick in my mind and I can still remember some of the holds and moves from these routes three years later. Motivation and belief as well as fitness led to my success on these routes. I was pushing my limits and keeping my mind open. As always I have been thinking about how to climb at my limit and this article about Kevin Jorgeson is pretty interesting. While in Hueco he did the first ascent of a V8 and a V10 highball. Besides just being tall these problems both had bad landings where falling was pretty much out of the question. The Duel, V10, was climbed headpoint style so that Kevin could suss out the high crux without bad fall potential. 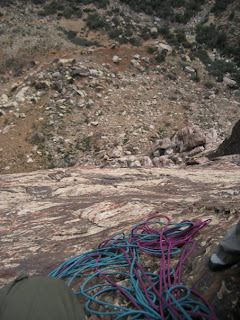 This style of climbing allows for an exchange of ground-up ethics for safety. On his send he climbed very calmly and really crushed the problem. It seemed that he was in full control even though he was climbing a hard problem. This type of control in hard climbing is what I would like to find. With rain and no really climbing last weekend I am really psyched for this weekend! If the weather holds we will be doing a bit of muilt-pitch sport on Saturday and some crack training at Mt Woodson on Sunday.